Draft: 2008, Philadelphia Phillies, 3rd rd. In his Major League career has made 97 starts and 66 relief apps for the Phillies, Twins, Pirates, Orioles and Marlins...in 2011 was a finalist for the BBWAA's National League Rookie of the Year Award, along with winner Craig Kimbrel and Freddie Freeman of the Braves...was a mid-season Eastern League All-Star in 2009 and 2010...was International League Pitcher of the Week for 6/18-6/24, 2013 and Eastern League Pitcher of the Week for 5/5-5/11, 2009 and 7/6-7/12, 2010...in 2005 graduated from C.K. 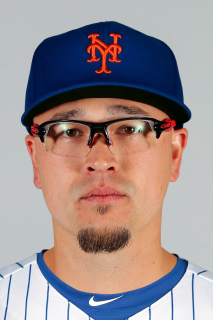 McClatchy High School in Sacramento, CA...pitched for 3 seasons at Long Beach State University (2006-2008), where in 32 career starts and 15 relief apps he went 12-13, 3.99 (230ip, 145k)...is one quarter Chinese and one quarter Taiwanese...mother is from Hong Kong. Went to spring training camp with the Nationals but was released on 3/29...2 days later was signed by the Marlins to a minor league contract...began the season at Class AAA New Orleans, where he made all 8 of his starts before he was promoted on 5/20...spent the rest of the season with the Marlins...for Mia went 2-5, 7.39 in 12 starts and 0-1, 5.59 with 1 save in 12 relief apps...earned his second professional save in the 13-1 win vs NYM on 9/18 (3ip, 4h, 0r, 1bb, 4k)...in Marlins history, was the largest margin of victory in a game with a save awarded...earned his 2 wins in consecutive starts, on 8/2 vs Wsh (7-0) and 8/8 at Wsh (7-3)...in those 2 starts allowed just 1 run in 13.0 innings...became a free agent following the season and on 1/9/18 was signed by the Reds to a minor league contract with an invitation to Major League spring training camp. In his only season with the Orioles made a career-high 35 apps, including 4 starts...missed time in June with a strained right groin...in the seventh inning or later posted a 1.45 ERA...threw more than 1.0 inning in 21 of his 31 relief apps...from 4/22-5/25 didn't allow a run over a career-high 10 apps, all in relief (16ip, 15h, 5bb, 14k)...earned his first professional save in an 8-1 win vs Wsh on 8/23. Went to Spring Training as a member of Minnesota's 40-man roster ... Was acquired by Pittsburgh on 3/25 and assigned to Triple-A Indianapolis ... Spent time with Extended Spring Training program in Bradenton, FL, before making debut with Indy on 5/6 (6.0 IP/1 ER) ... Was victorious in his second start on 5/12 vs. Norfolk (7.0 IP/2 ER) ... Struck out season-high 10 batters while giving up two runs in 8.0 IP during a 5-2 victory vs. Buffalo on 5/28 ... Tossed 8.0 innings while winning a 4-2 decision at Lehigh Valley on 6/8; also went 3-for-3 with a home run at the plate ... Pitched at least 6.0 innings in six of his seven Triple-A starts ... Was selected by Pittsburgh on 6/15. Acquired by Twins from Philadelphia December 6, 2012 along with right-handed pitcher Trevor May in exchange for outfielder Ben Revere. Was Twins Opening Day starter April 1 vs. Detroit, allowing three runs on eight hits in 6.0 innings pitched and was dealt the loss. Won first game as a Twin May 11 vs. Baltimore, allowing five runs on 11 hits in 5.1 innings pitched, snapping a four-game losing streak to start the season. Allowed eight runs May 22 at Atlanta, raising ERA to 7.21 and was optioned to Triple-A Rochester after the start. Pitched a complete game shutout in first start with the Red Wings May 27 vs. Lehigh Valley, allowing five hits and four walks, earning the win. Went 5-0, 3.21 ERA (33.2 IP, 12 ER) in final five starts of the season June 17-July 7, including back-to-back complete games, the first being a 7.0-inning shutout with one run allowed June 17 at Scranton-Wilkes/Barre, and the second being a 9.0-inning complete game shutout June 22 at Louisville. Named International League Pitcher of the Week June 24. Had an MRI on right shoulder at the end of August, which did not reveal problems, but was shut down for the rest of the season. Made Phillies Opening Day roster for the first time in career. ... Posted a 13.0 inning scoreless streak April 14-24. ... Recorded a career-high 11 strikeouts April 19 at San Diego. ... Went 2-1, 1.97 (32.0 IP, 7 ER) in five April starts. ... Placed on the 15-day disabled list with right elbow inflammation (bone chips) May 16-June 3. ... Did not strike out a batter for the first time in career August 1 at Washington (7.0 IP); had recorded at least one strikeout in each of first48 career appearances (41 starts). ... Placed on the disabled list with loose bodies in right elbow August 29 through the end of season; had surgery to remove lose body andbone spur September 7. ... Pitched 6.0-plus innings in 16 of 23 starts. Finished 3rd in NL Rookie of the Year balloting with 40 total points (8 second-place votes and 16 third-place votes). ... Ranked 1st among NL rookies in ERA (3.01), T-1st in CG (1), 2nd in wins (11), 3rd in opponent's avg (.237), 4th instarts (21) and strikeouts (119), 5th in innings (131.2). ... Began season with Lehigh Valley (AAA). ... Was recalled from Lehigh Valley four times (4/29, Blanton DL'd; 5/23, Blanton DL'd; 6/16, Romero designated; 7/15, Mathieson optioned). ... The Phillies went 16-5 (.762) in his 21 starts, the best team winning % for any starter in the majors (min. 20 starts). ... Had a .900 winning % (9-1), 1.87 ERA (20 ER, 96.1 IP) and .198 opponent's avg (68-317) in 18 night games, all MLB bests among starters with at least 50.0 IP. ... 65 of his 119 strikeouts were looking (54.6%). ... Went 6-2, 2.72 ERA (16 ER, 53.0 IP) in 12 games (8 GS) against the NL East. ... Allowed 3 ER or fewer in 25 of his 30 starts combined between Phillies and Lehigh Valley (83.3%). ... Had a NL-best 9-game win streak, 6/29-9/6 (12 GS, 9-0, 2.87 ERA, 24 ER, 75.1 IP); was the longest streak ever by a Phillies rookie pitcher and tied for the 4th-longest in franchise history. ... The Phillies won 14 consecutive starts by him, 6/18-9/6, the longest single-season streak since they won a clubrecord 15 straight starts made by Steve Carlton in 1972; the longest streak for a ML rookie since 1970 (CIN's Wayne Simpson, 14). ... Singled off Mike Pelfrey for his first ML hit, 4/29 vs NYM. ... Had a career-best 21.0-inning scoreless streak, 9/6/10-5/4/11. ... Became the first Phillies rookie pitcher to win each of his first two starts of a season (4/29 & 5/4) while pitching at least 6.0 innings and allowing one run or fewer in each start since Marty Bystrom in 1980. ... Did not allow a HR in 43.0 consecutive innings, 6/18-7/26. ... Threw his first career complete game, 7/26 vs SF. ... Won five straight starts, 6/29-7/26, tying the longest streak by any major league rookie pitcher in 2011; was also the first Phillies rookie to win 5 straight starts since Charles Hudson, 7/20-8/8/83. ... Allowed two ER or less in seven consecutive starts, 6/18-7/26. ... Set a career high with 9 SO, 8/23 vs NYM. ... Led all ML rookie pitchers in hits (10) and RBI (5). June 21, 2018 Las Vegas 51s released RHP Vance Worley. May 18, 2018 Las Vegas 51s placed RHP Vance Worley on the 7-day disabled list retroactive to May 16, 2018. April 29, 2018 RHP Vance Worley assigned to Las Vegas 51s. April 19, 2018 New York Mets signed free agent RHP Vance Worley to a minor league contract. April 2, 2018 Louisville Bats released RHP Vance Worley. January 9, 2018 Cincinnati Reds signed free agent RHP Vance Worley to a minor league contract and invited him to spring training. January 9, 2018 RHP Vance Worley assigned to Louisville Bats. October 7, 2017 RHP Vance Worley elected free agency. October 7, 2017 Miami Marlins sent RHP Vance Worley outright to New Orleans Baby Cakes. May 20, 2017 Miami Marlins recalled RHP Vance Worley from Batavia Muckdogs. May 18, 2017 RHP Vance Worley assigned to Batavia Muckdogs from New Orleans Baby Cakes. April 5, 2017 RHP Vance Worley assigned to New Orleans Baby Cakes. April 4, 2017 Miami Marlins signed free agent RHP Vance Worley to a minor league contract. April 3, 2017 Syracuse Chiefs released RHP Vance Worley. January 31, 2017 Washington Nationals signed free agent RHP Vance Worley to a minor league contract and invited him to spring training. January 31, 2017 RHP Vance Worley assigned to Syracuse Chiefs. December 2, 2016 RHP Vance Worley elected free agency. October 5, 2016 Baltimore Orioles activated RHP Vance Worley. October 4, 2016 Baltimore Orioles reassigned RHP Vance Worley to the minor leagues. June 30, 2016 Baltimore Orioles activated RHP Vance Worley from the 15-day disabled list. June 28, 2016 Baltimore Orioles sent RHP Vance Worley on a rehab assignment to Frederick Keys. June 25, 2016 Baltimore Orioles sent RHP Vance Worley on a rehab assignment to Bowie Baysox. October 20, 2015 Baltimore Orioles claimed RHP Vance Worley off waivers from Pittsburgh Pirates. October 8, 2015 Pittsburgh Pirates activated RHP Vance Worley. October 7, 2015 Pittsburgh Pirates reassigned RHP Vance Worley to the minor leagues. September 15, 2015 Pittsburgh Pirates selected the contract of RHP Vance Worley from Indianapolis Indians. August 7, 2015 Pittsburgh Pirates sent RHP Vance Worley outright to Indianapolis Indians. July 30, 2015 Pittsburgh Pirates designated RHP Vance Worley for assignment. June 15, 2014 Pittsburgh Pirates selected the contract of RHP Vance Worley from Indianapolis Indians. May 6, 2014 RHP Vance Worley assigned to Indianapolis Indians from Jamestown Jammers. April 1, 2014 RHP Vance Worley assigned to Jamestown Jammers. March 25, 2014 Minnesota Twins traded RHP Vance Worley to Pittsburgh Pirates for cash. March 21, 2014 Minnesota Twins sent RHP Vance Worley outright to Rochester Red Wings. October 2, 2013 Vance Worley roster status changed by Minnesota Twins. September 13, 2013 Rochester Red Wings activated RHP Vance Worley from the 7-day disabled list. July 16, 2013 Rochester Red Wings placed RHP Vance Worley on the 7-day disabled list retroactive to July 14, 2013. May 23, 2013 Minnesota Twins optioned RHP Vance Worley to Rochester Red Wings. December 6, 2012 Minnesota Twins traded CF Ben Revere to Philadelphia Phillies for RHP Trevor May and RHP Vance Worley. October 5, 2012 Vance Worley roster status changed by Philadelphia Phillies. August 29, 2012 Philadelphia Phillies placed RHP Vance Worley on the 15-day disabled list. Loose bodies in his right elbow. June 4, 2012 Philadelphia Phillies activated RHP Vance Worley from the 15-day disabled list. May 16, 2012 Philadelphia Phillies placed RHP Vance Worley on the 15-day disabled list retroactive to May 12, 2012. Right elbow inflammation. July 15, 2011 Philadelphia Phillies recalled Vance Worley from Lehigh Valley IronPigs. July 5, 2011 Philadelphia Phillies optioned Vance Worley to Lehigh Valley IronPigs. June 17, 2011 Philadelphia Phillies recalled Vance Worley from Lehigh Valley IronPigs. May 31, 2011 Philadelphia Phillies optioned Vance Worley to Lehigh Valley IronPigs. May 23, 2011 Philadelphia Phillies recalled Vance Worley from Lehigh Valley IronPigs. May 16, 2011 Philadelphia Phillies optioned Vance Worley to Lehigh Valley IronPigs. April 29, 2011 Philadelphia Phillies recalled Vance Worley from Lehigh Valley IronPigs. March 18, 2011 Philadelphia Phillies optioned Vance Worley to Lehigh Valley IronPigs. October 25, 2010 Vance Worley roster status changed by Philadelphia Phillies. October 5, 2010 Philadelphia Phillies reassigned RHP Vance Worley to the minor leagues. September 6, 2010 Philadelphia Phillies recalled Vance Worley from Lehigh Valley IronPigs. July 25, 2010 Philadelphia Phillies optioned Vance Worley to Lehigh Valley IronPigs. July 21, 2010 Philadelphia Phillies selected the contract of Vance Worley from Reading Phillies.